You know, I complain alot of froyo, I understand this. Oh I say it's too light, it's too bland, it's too tangy, it's too fatty, it's got too many calories, it's too this, it's too that... I don't mean to be overly critical, I just can't help it. Well, fellow ice cream lover Nick tipped me off that Hannaford's actually has a respectable in-house brand of Greek frozen yogurt. Hey, for a $1.99 a pint, what's there to lose? 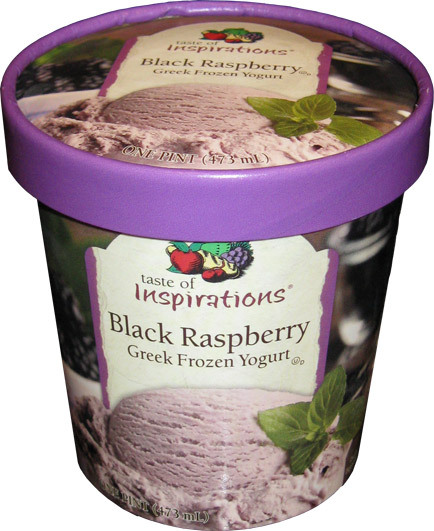 This is the Taste of Inspirations Black Raspberry Greek frozen yogurt. There were four or five flavors in my particular store, all fairly standard. I bought this and also the Strawberry. Note that Hannaford's is owned by Delhaize (a Belgium company) that also owns the mighty Food Lion (well over a thousand stores), Sweet Bay, Harvey, and Bloom. Looks normal enough right? 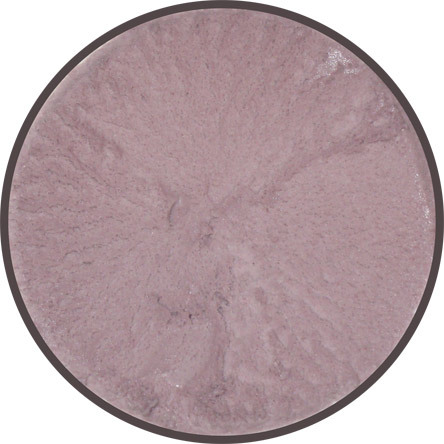 Not super creamy and not super solid, but a nice middle of the road texture that struck me as fairly soft but not gummy. Now take the texture you see above and add in a nice acceptable low-fat flavor. Sure, there's a small bit of skim milk (or yogurt) funk, but it's so mild I don't care. I'd rather have a hint of skim milk then have to chew my flavorless treat. In fact, that mild yogurt reminder actually makes me want to put on some mixins like granola or graham cracker (oh, it's very tasty with the crushed graham cracker). It's a nice, uncomplicated flavor and I obviously like it. Now on one hand, I could easily blow through this two dollar pint if I wanted to. On the other hand, it's kind of filling despite being somewhat light. The texture and flavor are in a place were I don't need to eat a ton. I enjoy my serving and think "ahh, that was nice, I need to save this for later". Actually, that's the star point right there. This is a "cheap" froyo yet I'm saving it for later. I'm not putting it off mind you, I'm saving it. I'm shocked how much I like this actually. Yes, it helps it's not tart, but I enjoyed this ten times more than the new B&J raspberry froyo. I can't stress this enough but either you go fancy or you keep it simple. No, this isn't perfect, but when you factor in price, nutrition, flavor and texture all together, this one becomes a winner in my book. If they could make this stuff all natural there'd be no reason to buy anything else. Nice job on this. thanks for the tip, I can't wait to break into the strawberry either tonight or tomorrow. I tried this and it was quite good, tasting like a pretty good quality ice cream, so I wondered how this is frozen greek yoghurt? The ingredients label doesn't help. There is nothing that suggests that there is yoghurt in here. The listed milk products (milk and cream) are not cultured. There is no identification of any bacillus necessary in making yoghurt. So, how about it, Hannaford? I know greek yogurt is all the rage now, but is there anything about this product that suggests that the it is honestly named?